Iron Man Collectible Set Sweepstakes! Sideshow and the TCL Chinese Theatres in Hollywood have teamed up to give you a chance to win a prize from the Marvel movie universe! 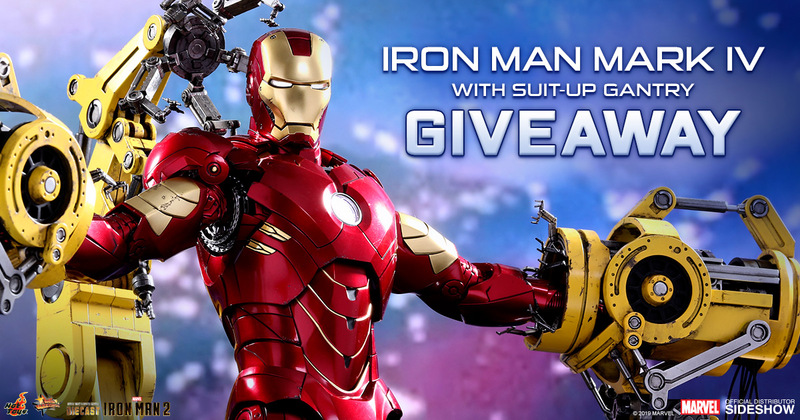 Enter now and you could win Hot Toys‘ Iron Man Mark IV with Suit-Up Gantry Collectible Set! Get exclusive deals and updates by joining Sideshow's newsletter. I agree to the Terms & Conditions of the contest, and agree to pay shipping charges for my prize, unless otherwise specified in the contest description*. Limit one entry per person. All winners agree to pay shipping on any prizes granted by Sideshow Collectibles during any contest or giveaway. International winners (including EU regions) will be responsible for VAT, duties or import fees on the shipment of their prize that may be assessed by their governments. Due to customs requirements, the prize will be assigned a value of at least $1.00. Series content, product specifications, release dates and pricing are subject to change. Sideshow Collectibles is the registered trademark and copyright of Sideshow Inc.